Polao or Pulao originated in Persia where meat was used with rice. As it moved east towards Bengal region, fish was used instead of meat. For the Bengali Polao we have used Vhetki fish. But other types of fish like Salmon or bass, can be used as well. 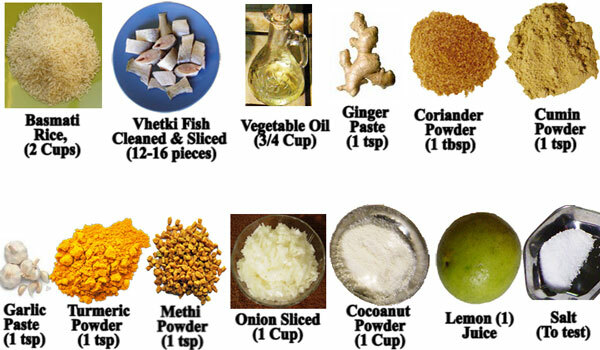 You will need the following ingredients for making the fish Polao. 1. First wash the Basmati rice with water and leave it soaking in that same water for an hour. 2. Add a half cup of vegetable oil to a medium hot pan. 3. When the oil heats up, add the ginger paste. 4. Add the coriander powder. 6. MiAdd the garlic paste. 9. Fry this mixture for about a minute. 12. Add the fish to the pan. 13. Fry for about 2 minutes. 16. Add 1 cup of water and mix the gravy. 17. Cover the pan and let the fish cook. 18. Flip the fish occasionally so that both sides get evenly cooked. 20. Then remove the pieces and set them aside. 21. Save the spicy gravy in a bowl for use later. 23. And add one third cup of oil to the pan. 25. Fry it till it is golden brown. 26. Take your bowl of rice, strain the water and add it to the onions in the pan. 27. Mix well and then fry the mixture for several more minute. 30. Add the spicy fish gravy. 32. Add 2 cups of water. 34. Stir the rice occasionally so that it does not burn. 36.Continue this process till the rice is soft. 37. When the rice is done, spread the fish over the rice. the flavor of fish and spices infuse the rice. 39. Turn off the stove. 40. Now is the time to add the lemon juice. 41. If you want, you can garnish the polao with cilantro. This completes the fish polao preparation. It serves 3 – 4 people and takes about 45 minutes to prepare.